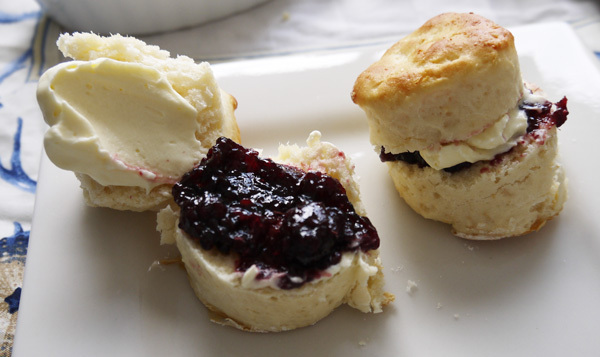 Homemade scones are an important part of English country cooking and this is the perfect scone recipe thats so simple you'll have thm on the table in less than thirty minutes. Just don't forget the piping hot cup of English Breakfast to wash them down. Preheat the oven to 200°C and lightly flour a round cake tin. 1. Sift the self raising flour, caster sugar and salt into a mixing bowl. 2. Using your finger tips rub the butter into the dry mixture. 3. Pour the milk into the mixture and gently stir until just combined. 4. Knead the dough on a lightly floured surface and roll out to 2cm thick and cut into circles 4.5-5cm wide. 5. Arrange scones in the cake tin so they are just touching and brush the tops with a little milk.